Progressive jackpot slots offer the potential for much higher wins than most slot games. Normally, each slot has a set jackpot which is individual to that game. With a progressive jackpot, every player playing that slot - at whatever casino, wherever they are in the world - is playing for a steadily increasing jackpot. Every time someone plays, the jackpot increases. The main attraction is, of course, the chance to hit a huge, life-changing win that could literally transform your financial future, turning you into a millionaire overnight. Many dream of such a win, which is why progressives remain a popular part of the online casino experience. Many of the slots listed below are network slots, which means the size of the jackpot climbs quickly, and they award million dollar wins on a regular basis. Look through the list of jackpot slots below, review each one, see what it has in store for you, and possibly be its next jackpot winner! What do you have to lose?! Mega Moolah is the first in a series and was the original big money progressive online. It hosts a Wild African theme with giraffes, gazelles, lions, zebras and others joining this wild adventure towards riches. Its features begin with a wild symbol, scatter and extra spins, and joining it are not one, but four progressive jackpots are waiting to fill your pockets with riches. Mega Moolah Isis is one of four in the Mega Moolah slot series. It offers an intense and interesting theme filled with wonder and mystery. Scatters, wild symbols, extra spins, multipliers, a gamble feature and four progressive jackpots are offered as features. Randomly triggered, its jackpot wheel includes a Mini, Minor, Major and Mega starting at £10.00, £100, £10,000 and an incredible £1,000,000, its opportunities are endless. 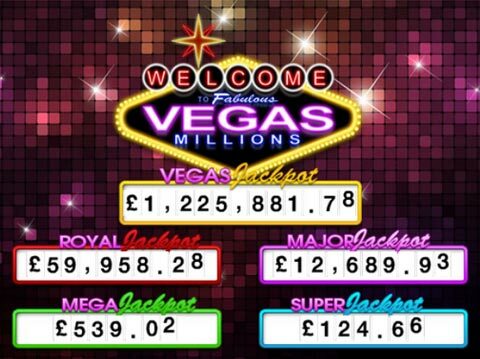 Major Millions is another in the Microgaming progressive slot line up. Like many of the Mega Moolah slots, it's based on one of the popular five reel slots featured under the Microgaming platform. This army-themed slot features many exciting elements and is offered as a three reel progressive as well as five reel. Wilds, multipliers, scatters and a progressive jackpot awaits those brave enough to challenge its reels. King Cashalot, an earlier progressive creation from Microgaming, still holds true for many slot players who want to play a classically styled progressive. King Cashalot offers a medieval theme, and not only includes a progressive jackpot but was the first progressive slot within the Microgaming library to offer a pick to win bonus game that allows the opportunities to discard picks and select others with the hopes of securing a larger win. Treasure Nile is one of the first and original progressive jackpot that Microgaming released. It continues to elicit high levels of play for its generous wins and classical slot approach. As a fixed bet slot, its cost is £0.50 per line or £4.50 per spin. To win the jackpot, you will need to get five Sphinx symbols on the 15th payline. Cash Splash was the very first Microgaming progressive jackpot, and it is offered in both a three reel classic and a modern five reel updated version. Those with a penchant for history will love this slot for its classical elements, while others will find its five reel modern version appealing due to its added features. As with several other Microgaming jackpot slots, WowPot was first released as a classic slot, and later an updated five reel version was added. This is an ideal game for those new to progressives and wishing to play a low betting limit progressive with great potential. Its modern five reel slot incorporates a wild symbol to increase winning potential. Lotsaloot is another in the long lineup of jackpot slots offered by Microgaming. It also comes in a three reel and five reel version and features a progressive jackpot. Themed around cash, its newest version includes a modern twist with added features and its classic offers the chance to hit one of five big money jackpots. Fruit Fiesta is a player favourite for it offers an inexpensive five reel, 15 payline progressive slot with a fruit theme, bright graphics and includes both a wild and scatter symbol. This slot also is featured in a three reel three payline classic and was the original of the two. Diamond Valley is one of Playtech's earlier slots that continues to remain popular due to its large wins and powerful presentation. The lure of diamond mining and the power of expensive crystals is one that conjured images of wealth and is one that people are drawn too. This slot is offered in both a classic five reel, five payline version as well as an updated one with added game features. Playtech’s Queen of the Pyramids is a unique rendition of the classic Egyptian themed slot. Its images are classic in design, simple, yet appealing and will a network progressive; it can have you discovering valuable artifacts of your own. Adding to its excitement is the ability to trigger up to 100 extra spins with a five times multiplier. The Age of the Gods is a new series of slots released by Playtech. These are meant to replace the outgoing Marvel slot series and include the four Power jackpots. Packed with an abundance of high-definition graphics and animation, each game in the series is feature rich and affords multiple big win opportunities. Fruit Mania is one of the original progressive jackpot slots that Playtech offered. Its vibrant fruit theme is one appreciated by many for the positive feelings that are felt while spinning its reels. It also includes a bonus game when three suns appear and a scatter symbol. Sweet Party is one of the newer jackpot slots released by Playtech. Those with a sweet tooth will enjoy the treats this slot has waiting to uncover. The main focus of Sweet Party is its progressive jackpot and unique jackpot sharing based on the number of candy symbols that form a winning combination. Everybody's Jackpot has been a real gem for Playtech, and big win hunters enjoy the ability to share in its jackpot. While it features a number of player-friendly features, playing it daily will ensure you enjoy a share of its jackpot when triggered. A player favourite, Gold Rally was another of the first progressive Playtech slots that featured a gold mine. Released as a three reel, eight payline slot, it includes a bonus game and substantial progressive jackpot. Mega Fortune is NetEnt's flagship progressive, and one that has become legendary with multi-million dollar wins, and lays claim to the title of the largest jackpot to date online. Featuring scatters, extra spins, multipliers and three jackpots, it is ideal for all player levels thanks to its minimum stake being only £0.25. Mega Fortune Dreams is the sister slot to Mega Fortune, and offers a tropical theme, with several enhanced features. While not as widely offered, it includes the same bonus features as the original, including its three jackpots, and throws in a few extra twists to increase the excitement it delivers. Arabian Nights, a NetEnt standard takes an interesting look at a well-used theme based on Arabian culture. This is one of their earlier slots and could do with receiving an update towards the symbols' overall appearance, but with the addition of its wild symbol, and ability to trigger a progressive jackpot, it remains a popular item on the NetEnt lineup. Cosmic Fortune was released several years ago, and until the release of Mega Fortune Dreams, it was the first slot in a long time offering a progressive jackpot. Its main appeal is its inexpensive per spin wager and that fact it includes five jackpots, along with multiple player favourite features such as wild symbols, scatters and a free fall bonus game.